'The Animated Series' Will Arrive on DVD in 2006! 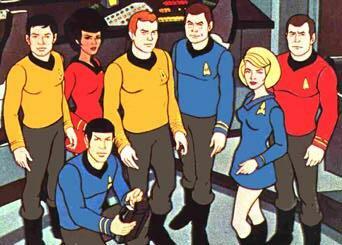 Paramount confirms that the 22 episodes will be released, possibly to coincide with Star Trek's 40th anniversary. I look forward to this release, I have all of the episodes on CD but the DVD's will complete my set nicely. Interests:Multi Media, Art and Graphics, Web Design, Technology, Web Businesses, Music, Guitar, Buddhism, Prostration, Meditation, Spending time with my Sangha at day courses at the Centre, Aromatherapy, Crystal Healing, Universe, Lotus Flowers, Fruit Smoothies, Apples, Swimming. Have you ever seen The Animated Series? Yeah, it was back in the early 1970's. Ohhh...yes...I remember now! I've never watched it but I've seen the artwork. How can I forget ST? Is the on the live action series? I haven't seen her. Interests:Hm, Warhammer, Martial Arts (Kung Fu, Zen Dan Kwan, GKR), Occult, studying the samurai, kendo, iaido. Interests:Computers, video, waether, radio, running, biking, games, T.V., music, and Star Trek. 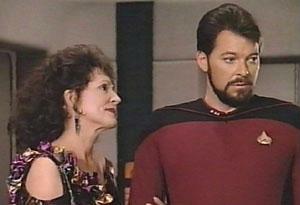 Watch season 2 episode 1 "Amok Time", that was a good Spock episode that she's in. i'm going to have to see it. that's for sure. Interests:Star Trek,Karate,Titanic,US western history,football,muscle cars. VBG......You really want to freak him out, show him a pic of Number 1 from "The Cage".. 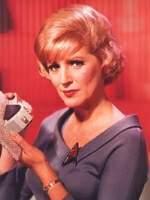 The definitive Nurse Chapel episode is "What Are Little Girls Made Of"
Wasn't she the chick in Amok Time when Spock chucks a hissy fitt and throws something at her? I havn't seen that episode in ages. And yes, please post a pic of "The Cage"
I saw that episode recently, but I don't remember her being in it! Thats her. She was always in love with Mr. Spock but only revelaed that once in "The Naked Time"
She's the one on the right. Everyone knows that she married Gene Roddenberry in the 70's right? and if I don't mind saying. I can definetly see where Deana gets her good looks from!!! I'm really looking forward to getting all of TAS when it comes out. I watched it when it first came out. It's hard, imo, for people who didn't live through that period, to realize how exciting it was to have a Trek series again, after the cancelation of TOS. 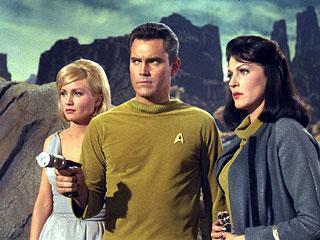 Additionally, there were some really great and interesting episodes, and they were not limited by budget as TOS was. They didn't have to do an episode using only existing sets just to stay on budget for the year! Can't wait! The Digital Bits predicted that the animated series DVDs might be released to coincide with Star Trek's 40th anniversary in September 2006. Well TAS is at least a better way to celebrate than Free Enterprise would be imo. There has been no word yet on how many discs might comprise the DVD set(s). I hope they don't greedy and release each of the 2 seasons separately, with each episode only being 30 mins long, all on one set would be ideal... unless they add TONS of extra features. Season 1 is 16 eps, season 2 is 6 so I think its going to be one set. DVDs always seem to hold 4 hours a disc, so probably 3 discs with some extras. Season 1 on the first two, season 2 on the third.